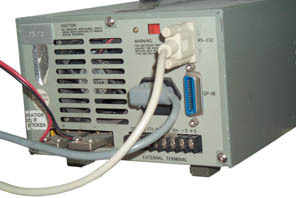 An electronic load allows a source of power such as a power supply, battery, solar cell, etc. to be tested with a load that can be changed. This provides much more information than a fixed load would give you. It makes load testing very easy, you just punch in the kind of load and it's value. No worries about letting the smoke out of load resistors. The American Reliance EL-1132 Electronic Load is rated for 2.5 to 60 Volts, 0 to 60 Amps and 300 Watts max power. It has both RS-232 and GP-IB remote control capability as well as accepting an analog programming voltage. In addition it has voltage and current read back. The load can be programmed as a current, resistance or voltage. In addition it can do a number of dynamic loading conditions that you can program. Rather than use variable pots for calibration it has a all electronic calibration that can be done without opening the case. It's an IEEE 488.2 device and responds to SCPI commands. So a driver for any modern eLoad should work. 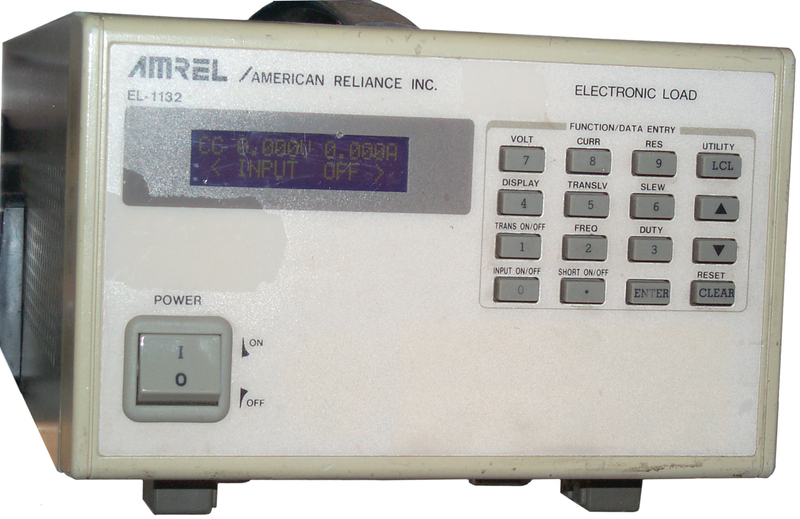 Even though this used unit is no longer being sold, AMREL was able to supply the manual and calibration instructions. This is top quality service. The used unit I bought from Mike Murphy had seen many years of use in a cell phone battery plant in Mexico. It was far out of calibration (30 to 40% error between the EL-1132 metering and external meters. After calibration the EL-1132 meters and set points are within a few percent. There are many calibration steps and most of them require a 6V @ 60 A power supply. These are hard to come by and very expensive. A simple way to get the approiate source is to use a 12 Volt battery (I used a 115 AH marine deep cycle battery) and 50 feet of 10-2 romex to connect the battery to the EL-1132. This length (loop length = 2 * 50 = 100 feet) of #10 solid Cu wire has a resistance of about 0.1 Ohm. With 60 Amps flowing the drop will be about 6 Volts bringing the voltage at the EL-1132 terminals to about 5 Volts, thus keeping the power dissipated in the EL-1132 below its 300 Watt limit when the calibration process draws a little less than 50 Amps for the high current ranges. The max current for #10 wire based on the NEC is just over 20 Amps, but it's fusing current is around 300 Amps, so works well for this short duty application. You will need a DC current shunt to provide a way to measure DC currents in the less than 60 Amp range as well as a voltmeter to measure the voltage on the EL-1132 terminals. This self calibration did not work well, so I sent the EL-1132 to AMREL for a factory cal. By using a LabVIEW program to control the EL-1132 I was able to make a State Of Charge (SOC) tester for the BA-5590 LiSO2 Battery that correlated very well with my TS-4403 and some test batteries supplied by the Army with SOC marked on each one . It is very difficult to test this chemistry and the TS-4403() tester is the only one on the market that can do it. Computer Battery Analyzer (CBAII) by West Mountain Radio is a similar electronic load good for 150 Watts in stock configuration but for 500 Watts with an optional add on unit. It works with software on a PC. It does not include charging and so the results are very dependent on the charging technique. This is the [an error occurred while processing this directive] time this page has been accessed since since Dec. 20, 2001.